Above: With family and friends; I am first from the left; my father, Ioannis, is in the middle; my mother, Anthipi, is fourth from the right); and my sisters Erato and Erifili, are second and first from the right respectively. Above Right: High school students in Mytilene. From left, we are: myself, Dimitrios Lambousis, Theodoros and Giorgos Mirikos. Above: As a young teenager. Above Right: In the fifties, I was involved with a Greek basketball team in Sydney, Hellenic. I am in the middle; I only remember Savvas Savvas (second from the left). Above: With my wife, Fotini. Above Right: With the Premier of New South Wales, Neville Wran. From left, we are: Dimitrios Liakatos, myself, Takis Caldis (a State Parliamentarian himself) and the Premier, Neville Wran. Above: With my wife, Fotini (third from the right), my sister, Erato (second from the right) and my brother-in-law, Giorgos Koukides (second from the left). 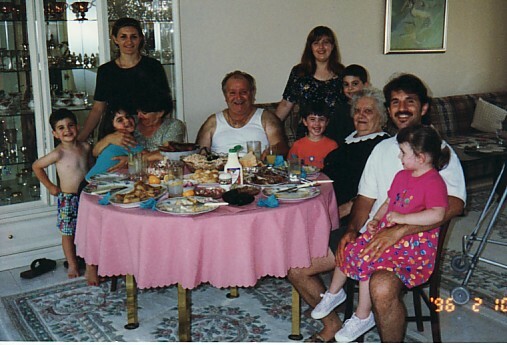 Above Right: With my mother, Anthipi, son, Ioannis and his wife, Eleni, my niece, Eleni, and my grandchildren, Thomas, Diana, Fotini, Adriana, Ioannis and Stephanie.